Monte Vettore (from latin Vector, "winner") is a mountain of the Apennines. It is the highest peak of the Cyblings massif. 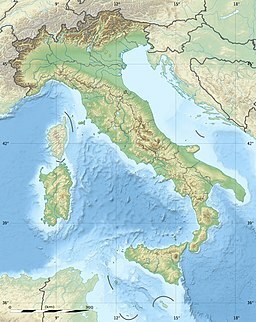 The southwestern side of Cyblings massif, Vector, is included in Sibillini Mountains National Park. Below the summit of Vector lies a small glacial lake in a small enclosed valley between Redeemer Peak. Apennine Sibyl by Adolfo de Carolis. In Il Guerrin Meschino, written by Andrea da Barberino about 1410, the central episode of the sixth part (Canto V) contains the "prodigious adventures" of Guerrino with this enchantress, the "Fata" Alcina, whom he seeks out, against all advice. He locates her cavern in the mountains of central Italy with the aid of Macco, a speaking serpent. She shows him the delights and horrors of her cavern, where sinners have been changed to the appropriate animals, but where sin is the only path to the knowledge of his real parents that he seeks, and Guerrin has to flee. The Mountain Apennine here looms over the country with exceedingly high cragged tops, in which one finds that huge cave called Sibylla's cave, (in their language Grotta de la Sibylla) and which the poets would have the Elysian Fields. For the common people dream about a certain Sibylla [supposed] to be in this cave, who [is claimed to] possess a large kingdom full of gorgeous buildings and Princely palaces, covered with pleasant gardens, abounding with many fine lecherous wenches and all kinds of pleasures and delights. All of these she will bestow on those who through this cave (which is always open) will come to her. And after they have been there for the period of one whole year, they have the freedom and liberty given to them by Sibylla to depart (if they please) and from that moment, having returned to us, they state that they live a most blessed and happy life ever after. This cave is also known to our countrymen by the name of VROU VENUS BERGH, that is, The Lady Venus mount. Locally the Sibilla was in some sense a beneficent fata whose retinue would descend from her mountain at times to teach the village girls all the secrets of spinning and weaving (see Weaving (mythology) for other European weaving goddesses), and perhaps to dance the saltarello with the best of the young men. But if they were not back in their mountain fastness by sunrise, they would be denied access and would become mere mortals. On one occasion, what with dancing and pleasure, the faterelle had not noticed the approach of dawn. Scrambling up the Vettore, their goatlike feet crushed the rock to fragments. They reached the safety of their grotto just before dawn, but the long slope of talus is still pointed out as the Path of the Fata. ^ [htqtp://utenti.lycos.it/umbriadascoprire/castelluccio.htm Umbria :Castelluccio di Norcia]. ^ Compare the legend of the Venusberg. Wikimedia Commons has media related to Monte Vettore. Romance of Guerrin il Meschino, Part Six (abstract in modern Italian). Cooperation Network for European Culture Ascoli Piceno. Casual reference to the Pontius Pilate connection. Monique Bouquet and Françoise Morzadec, 2004. La Sibylle: Parole et représentation. Collection "Interférences". (Rennes: Presses Universitaires de Rennes) discusses Antoine de la Sale's Paradis de la Reine Sibylle. This page was last edited on 3 June 2018, at 17:40 (UTC).